The data for your iWork documents is stored in files on your iPad, possibly on your Mac, and also sometimes on shared webDAV (Web-based Distributed Authoring and Versioning, used for collaboration and managing of files on the web) servers and, as you will see, on iCloud, if you choose. You can also take advantage of the fact that iWork documents can by synced across all your devices via iCloud. Deep down inside the iPad operating system (iOS) are files and folders, but most of the time you manipulate them through apps. When it comes to apps, the files and folders are in a special area reserved only for that app (it’s called a sandbox). From the Documents window, open the document you want to share. The Share popover allows you to Share a Link via iCloud (which allows others to make changes to your document); Send a Copy via AirDrop, Messages, or Mail; or open the document in another format such as PDF and share it in that format. You can move files to and from iTunes on your computer with a cable or with a Wi-Fi connection. You can also use cloud storage programs such as Dropbox to manage files, which is sometimes simpler and avoids certain constraints imposed by Apple-centric iTunes. Connect your iPad to the computer where you want to move the files. Your computer can be a Mac or PC. It must have iTunes installed. You can also sync between your iPad and your computer using a Wi-Fi connection rather than a cable. On the iTunes Summary screen, select Sync with This iPad over Wi-Fi under Options. If you have that option turned off or do not want to use it, you can connect your iPad to your computer with a cable. When iTunes launches, find your iPad in the Devices section of the Source List and select it by clicking once. Select the Apps tab from the group of tabs running across the top of the pane. If you’re running iTunes with the OS X Mavericks on a Mac, you won’t see an Info tab to the left of the Apps tab, but you will if you’re running Yosemite. Scroll down to the bottom of the pane and select the iWork app you’re interested in. 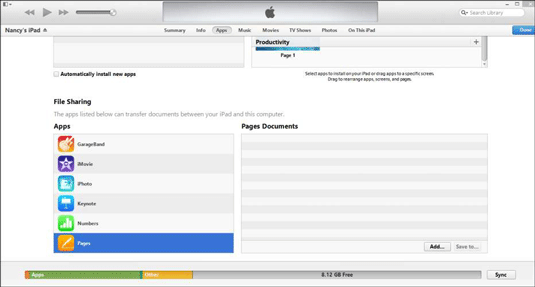 The documents on your iPad for that app are shown. Select the document you want and click Save To. Choose the folder and the name you want to use for the saved file. The file is moved to your computer. Connect your iPad to the computer from which the files are to be moved. You can use a cable or a Wi-Fi connection if you have selected that option. You can use a Mac or PC, but you must have installed iTunes on it. Find your iPad under the Devices section of the Source List and click it. The documents on your iPad for that app are listed. Click Add in the lower-right portion of the window. When prompted, select the file on your computer’s hard drive. When you select a file, it moves to the list of files in iTunes and usually moves immediately to your iPad. If it doesn’t move immediately, click Sync. You can also simply drag the document icon from the Finder or Windows File Explorer window into the file list area.